Passenger Pigeon is a project/concept for collecting aerial imagery from passenger plane windows with handheld digital cameras. To make a map, just take photos out the window of your commercial flight. Then use the free and open source MapKnitter.org to align the images with a map as soon as you land. Nothing yet on the topic "passenger-pigeon" -- be the first to post something! 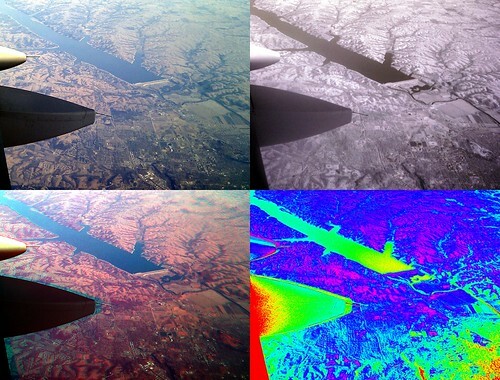 Some Public Lab folks have done multispectral imaging from a plane window -- see the near-infrared camera page for details on how to collect/produce infrared imagery with less than $150 of equipment.